Taste the perfection of 100% Barilla quality at any moment with Italian-Style Entrées. 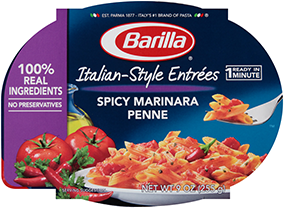 Paired with the Barilla pasta you know and love, our Italian-inspired entrées are a flavorful, easy pasta meal in no time, ready in just 60 seconds. Chicken Alfredo Italian Style Entrée is made with non-GMO ingredients. For more information, please read our position.